FARA is a Norwegian company that develops ticketing solutions for public transport authorities (PTAs) throughout Norway and abroad. 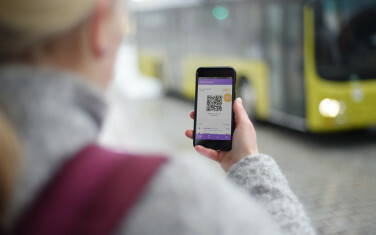 EGGS has helped design an ID-based technological platform in the cloud called Next Generation Ticketing - a service offering passengers the optimal travel experience, including a more convenient way of paying. Next Generation Ticketing is a new service concept that's intended to make travelling on public transport as stress-free as possible. It's been designed to work with FARA’s new ID-based technological platform in the cloud. The overall aim of Next Generation Ticketing is that it's dictated by the terms of the passenger, thus making ticketing much easier to manage compared to other systems currently available. To ensure this, three value principles have been developed: Always with a Ticket, Smarter Travel Deals and Group Benefits. All three are intended to function as quality markers whilst FARA further develops its digital ticketing solutions. Always with a Ticket gives passengers the option of using their phone, credit card or travel card to register a payment. Their ticket is then stored in the cloud as opposed to them being given a specific card or paper receipt. Smarter Travel Deals lets passengers pay for their entire journey, regardless of what transport they combine or who the provider is. The goal is to simplify their payment plans by shifting the responsibility of calculating their best option over to the PTA, who figure out the cheapest price model for them based on passengers travel activities. Group Benefits aims to easily accommodate multiple passengers, such as families travelling together or staff who’s travel expenses are covered by their employer. It makes everything more manageable for collective ticket purchases. Next Generation Ticketing is a set of user-centric concepts that aims to offer passengers a simpler travel experience. It comprises common apps and ticketing platforms available across multiple digital formats. EGGS not only helped FARA design the Next Generation Ticketing service concept, we also designed the app to be used with it. Everything focused on passengers needs and what the optimal benefits were for them. Ideas for digital app services were then prototyped and tested, leading to further user insight. This helped us improve our ideas to an even greater extent. In addition, we helped design and develop the validator - the device that passengers point their phone at or press their card against to confirm payment when boarding a bus, boat, train or tram. FARA’s new travel concept allows passengers to hop on and off various modes of transport as part of their journey, without the hassle of buying a new ticket each time. All their tickets and travel activities are registered in a cloud-enabled service. As a result of the project, EGGS has helped guarantee that design thinking has become an established part of FARA’s entire organisation. 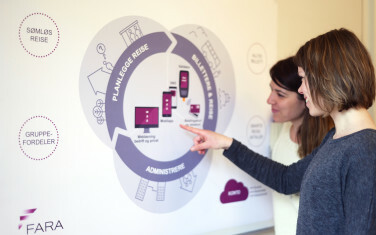 Using service design as a systematic method for mastering service innovation has enabled the company to carve new paths towards future product development. Previously FARA had always been bound by the rules and regulations set by the PTAs. Now for the first time, the focus is on passengers needs and what’s best for them, not what’s most convenient for the PTAs. This complete shift from reactive product development to pro-active innovation is a huge change of mindset for FARA, and something that’s likely to lead to more exciting ticketing innovations in the future. Whether passengers are regular commuters, day-trippers or tourists, Next Generation Ticketing provides a silver lining in the cloud for everyone!